In nine years of travelling with my husband, this was only the second package holiday we had ever booked and the first one with Thomas Cook. Would we do it again? All the time we want an easy, stress free holiday that we don’t have to think about too much, yes we would! So, we had our beautiful baby boy in January this year and, believe it or not, we booked our Easter holiday when he was just two days old. I had just given birth to a 10lb 11oz baby and didn’t take an active roll in choosing this holiday. So my husband did something we had never done before…. we called Thomas Cook. For only the second time in our nine year relationship we were looking at booking a package holiday. We didn’t really know if this was the best type of holiday for us. Usually we book flights, accommodation and transfers separately as historically it usually works out a lot cheaper. We also enjoy doing it this way as it gives us a bit more freedom in choosing the best flight times, the best accommodation (we are willing to pay for), in the area we want it. However, we had just had a baby and we were looking for something easy, and this is exactly what we got. The girl we spoke to on the phone was lovely. She was very accommodating and understanding with my husband who was not his usual sharp self due to lack of sleep from baby duties. She looked through and discussed a range of holidays with us until we found the perfect trip. When booking our trips we are always looking for the best deal at the best price and this was no exception. Sleep deprived, utterly enamoured with our new creation and yet desperate to get a holiday in the calendar we ended up booking a holiday to Cala d’Or in Mallorca for two weeks staying in the 4 star hotel, Inturotel Sa Marina. It was a self catering package, including flights and transfers and we paid not much more than £1100! There was quite literally no ignoring that price. There were other holidays on offer for a similar price, but only for one week. So did we enjoy our package holiday? Absolutely! It was so so easy to travel this way with our little munchkins, and precisely what we needed when holidaying as a family of four for the very first time. There was no need to worry about where the transfer was, or looking out for the correct company or having numerous pieces of paper for all the different parts of the holiday. I just had one piece of paper and we followed the Thomas Cook logo everywhere, from start to finish. How easy is that! I think the loyalty and attachment we had to a certain way of travelling when we were young, free and single will probably fade slightly when travelling as a young family of four. The things we are looking for are a little different these days. Number one on my list when travelling with such a small baby is ease. With three hourly breastfeeding sessions and nappy changes and spit-ups and naps and poo explosions, sometimes my brain is a little bit full so it’s nice not to have to think too much when you’re on holiday. Thomas Cook did all the thinking for me! Lots of things change when you have a child, which you get used to. Then lots of things change again when you have two children! We have been converted to the way of the package holiday when travelling with children and will definitely use Thomas Cook again. When going to the Balearic Islands in late March early April, it’s worth saying that you’re probably not going to be getting into the outdoor pool very much. The average temperature was around 18 degrees celsius, but there was a wind that sometimes made it feel a bit chillier. So, when looking to book somewhere think about where your going and what time of year it is. If the weather can’t be guaranteed my tip would be to see if the hotel as an indoor swimming pool. This can be a true lifesaver when travelling with toddlers or children because if the weather is a bit cold or rainy for the beach, you can always keep them entertained in the indoor pool! For our three year old this was great as quite often daddy and daughter went on their own meaning I either got a lay-in, an hour with the baby or even time to read a book. Don’t overate the simple pleasures once you have kids! Self catering holidays can be really good for those with young families. Shopping in the local supermarkets can be a really positive experience for you and your little ones. You can explore weird and wonderful fruits together and investigate the ghoulish and slightly smelly fish counter, which is always a firm favourite with us. Daddy can peruse the exotic looking beers and, my favourite is sampling the wonderful array of biscuits on offer! Food can be a really exciting part of a self-catered holiday. Being self-catered also means you have a little more freedom with regards to when you eat. Routines, such as bedtimes and dinner times, are things that we try to keep intact when on holiday as we know our children work best like this. We can cook what they like, when we know they need it. It’s also another opportunity for us to spend quality family time around the dinner table. The other thing to look out for when booking with children is a kids club. We hadn’t even considered this before Mallorca, but our daughter got so much out of the 8pm mini disco. She absolutely loved it! By the end of the two weeks she was up on stage singing along to Let It Go, while the staff were busy buzzing around her trying to get the stage ready for the Tina Turner covers singer. As we were there for Easter Sunday our little girl was able to take part in the Easter Egg hunt put on by the kids club at the hotel. For her egg hunting efforts she was awarded with a chocolate egg, got make an Easter mask and joined in with some silly dancing and singing. All the events we attended were always well organised and the kids loved them! We didn’t use the kids club during the day. For us that is family time where we go exploring and fill our day with the adventures of Cala D’or. However, it was a great addition to our evenings and obviously we loved watching her join in with all the dancing and watch her grow in confidence night by night. Sa Marina was lovely. It was big, clean, had good self-catered rooms with small kitchenettes, indoor pool, outdoor pool and the afore mentioned kids club. The hotel was in a good position sitting just north of the main town of Cala d’Or. Even though it looks like it’s a long way from the beach, it was only a 10 minute walk from Cala Gran beach. With our eldest on her scooter and the baby in the pram we really enjoyed this walk through town and the opportunity to partake in a bit of window shopping. One of my favourite things about this hotel was the yoga sessions held every Monday and Friday. I had no idea it was something the hotel offered, so I ended up doing the classes in a pair of denim shorts and vest top. Not exactly appropriate yoga attire, nevertheless it was a great way for me to get an hour to myself and get back to doing something that I really quite enjoy but don’t always have the time for. Every night after the kids evening mini disco there was always something on for the evening entertainment such as singers, musical shows and acts. We didn’t get the chance to see any of these as we had to get back to put the children to bed. However, there were lots of bums on seats waiting for the shows to begin as we left, which suggests that they were quite good. One thing I would say about this hotel is they don’t like you to hang your washing over the balcony. Holidaying with a three month old means washing is in abundance and sometimes it didn’t all fit on the little line that was included. So…. I started to hang it over the balcony. I thought this was perfectly acceptable, but we got a very polite note under the door one day asking us not to. That’s right everyone, we were THAT family. This was a bit annoying as at the time all I could think was, where on earth is all this washing going to go!? However, it is a good example of the hotel keeping standards high and this is something we liked about the place overall, so can’t complain too much. For things to do in Cala d’Or read my next blog for some ideas to incorporate into your own holiday. 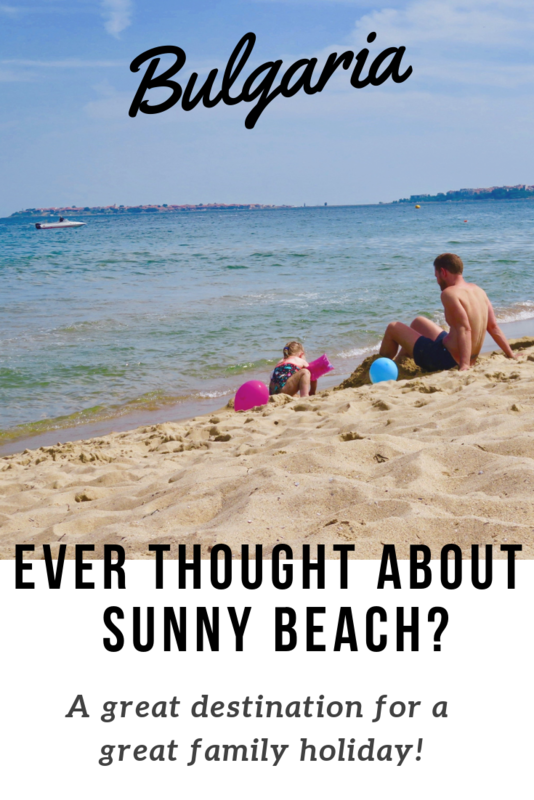 Ever Thought About Sunny Beach in Bulgaria?